Books that make a difference to your work – get more information auf Deutsch. 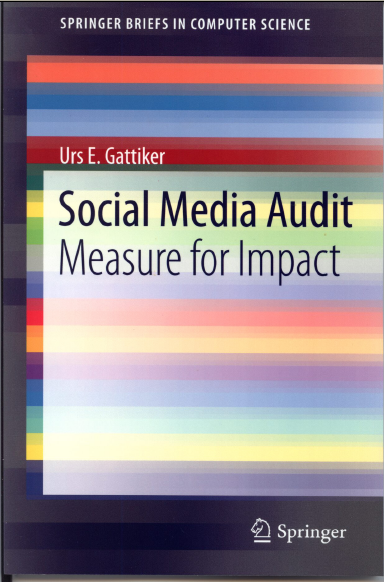 Urs E. Gattiker is the author of Social Media Audit: Measure for Impact (ISBN 978-1-4614-3602-7). The social media audit is an objective assurance and consulting activity. It is designed to add value and improve an organization’s social media operations. 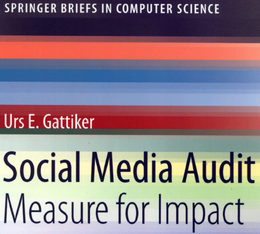 The book provides a set of templates and checklists that can be used to systematically assess an organization’s social media activities, and thereby gain the insights needed to improve the firm’s social media footprint (e.g., CyTRAP BlogRank). Social media has drastically improved the way we can reach target audiences and serve our customers. Like its financial counterpart, the social media audit (SMA) can be described as a formalized review of an organization’s social media activities. However, contrary to financial audits, social media audits are not guided by government regulations or a set of professional rules and standards. This book will address social media marketing issues using a cost-benefit approach, while presenting a template for systematically assessing your organization’s social media activities. Using the checklists and templates provided will enable readers to conduct an audit that helps identify target areas for performance improvement and recommendations for how to achieve those objectives. Social media platforms discussed include Facebook, LinkedIn, Google+, Pinterest, Twitter, Tumblr and Xing. In the meantime, join our 5,000+ subscribers and sign up for our blog – it is FREE! Get the next blog post first. As always, I love to hear your thoughts and opinions, so please leave comment. 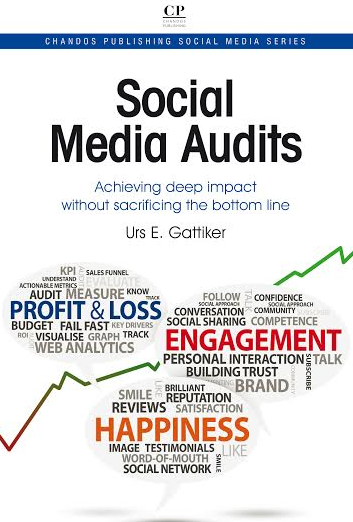 The author: This post was written by social media marketing and strategy expert Urs E. Gattiker, who also writes about issues that connect social media, strategy, ROI and compliance (click Google Scholar), and thrives on the challenge of measuring how it all affects your bottom line. CASEScontact.org (our security portal) use search function and find out about Adobe.